A guy riding his bicycle in the rain and discovered that big puddles can be difficult. AHAHAHAHA! That really is pwnage! I saw that happen in Chengdu, China! 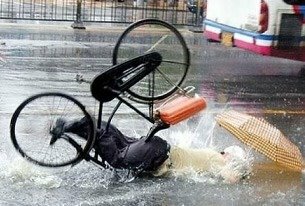 Just like that, in the rain too, only it was a woman... she bit the pavement big time. I was riding by in a bus, and so could not offer assistance.